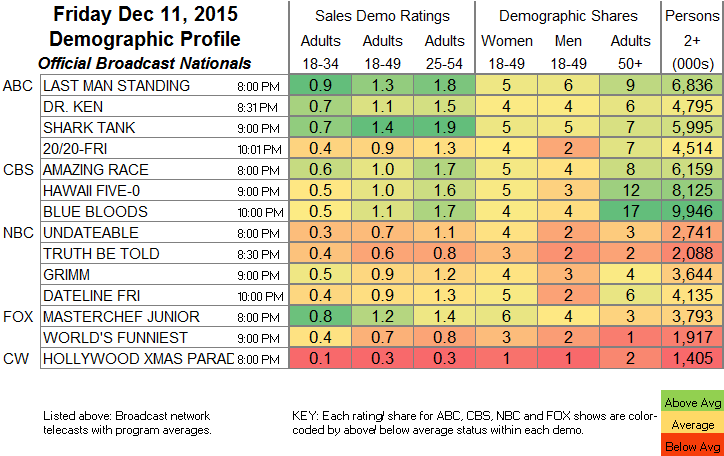 NETWORK UPDATE: There were no adjustments from the Friday preliminary ratings. CABLE HIGHLIGHTS: Discovery took Friday cable with 1.03 for GOLD RUSH, although that was down two-tenths from last week. Lead-in GOLD RUSH: THE DIRT was at 0.39. ESPN had the #2-3 slots with its NBA doubleheader, at 0.58 for the late game (Lakers vs Spurs), and 0.46 for primetime (Heat vs Pacers). 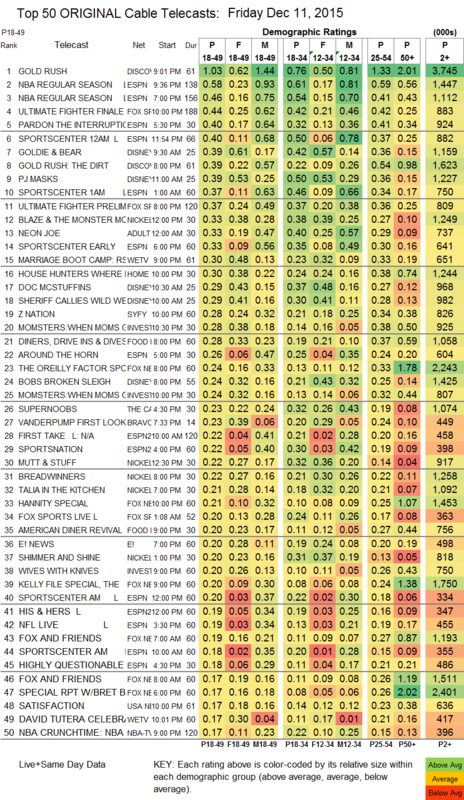 FOX Sports 1 scored 0.44 for its ULTIMATE FIGHTER FINALE, with the PRELIMS at 0.37. A pair of Disney Channel morning shows reached the Top 10, both at 0.39: GOLDIE & BEAR and PJ MASKS. Unaccountably, NEON JOE, which had been entirely consistent for Adult Swim throughout the week, plunged by 0.19 from Thursday to 0.33. We’s MARRIAGE BOOT CAMP was at 0.30. Syfy’s Z NATION slipped 0.03 to 0.28. USA’s SATISFACTION fell 0.05 to 0.17. On A&E, UNFORGETTABLE edged up 0.02 to 0.15. Cinemax’s THE KNICK lost 0.01 to 0.04.